﻿ La Terrasse des Oliviers Guest house Marrakech. JIMAT di Agoda.com! Ada soalan mengenai La Terrasse des Oliviers Guest house? Ketika melawat Marrakech, anda akan merasa seperti di rumah di La Terrasse des Oliviers Guest house, yang menawarkan penginapan berkualiti dan perkhidmatan hebat. Dengan lokasi hanya 2.0 Km dari pusat bandar dan 7 km dari lapangan terbang, hotel 4-bintang ini menarik banyak pelancong pada setiap tahun. Bagi anda yang ingin pergi agak jauh, Ma Creation, KE'CH Collecive, Rue Bab Doukkala Market merupakan beberapa daya tarikan untuk pelawat. Menawarkan tetamu hotel perkhidmatan yang unggul dan pelbagai kemudahan, La Terrasse des Oliviers Guest house komited untuk memastikan penginapan anda berada di tahap seberapa selesa yang mungkin. Khidmat bilik 24 jam, Wi-Fi percuma semua bilik, Wi-Fi di tempat awam, tempat letak kereta, khidmat bilik merupakan beberapa kemudahan yang membezakan La Terrasse des Oliviers Guest house daripada hotel-hotel lain di bandar. Semua penginapan bagi tetamu menawarkan kemudahan yang difikirkan dengan teliti bagi memastikan rasa selesa yang sukar ditandingi. Sama ada anda peminat kecergasan atau hanya mencari cara untuk bersantai setelah seharian bekerja, anda akan dilayan oleh kemudahan rekreasi kelas tertinggi seperti kolam renang terbuka. Apapun alasan anda untuk melawat Marrakech, La Terrasse des Oliviers Guest house adalah tempat yang sempurna untuk percutian yang menyeronokkan dan menarik. Very friendly staff and services were excellent. The meals they provide is also very good. Dinner is optional but worth a try for at least one day. Won't recommend having a self drive car in the Medina. 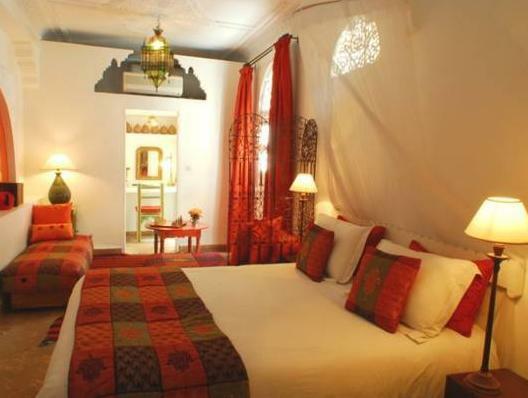 We were four days in Marrakech and found this 6 room riad lovely. Renaud and his staff were extremely friendly and helpful. Our room was very clean and had very thing that we could ask for. Our breakfast was served upstairs on the terrace and was very good. We would diffintely stay here again. This was long overdue. We travelled to Marrakech in December last year, but even the short stay at La Terrasse de Oliviers has left an indelible mark! Renaud and his staff are wonderfully hospitable and will go that extra step to make you feel at home. 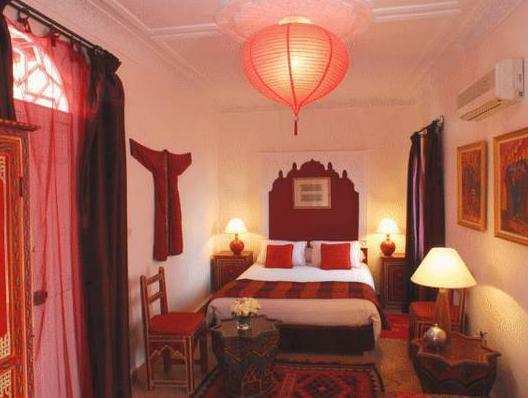 Even the Riad is homely, and located close to all major sights. We wish we had stayed longer, but the next time we return, we're going to stay here again for sure!! Merci! We stayed here for 8 nights with our 2 children in the room on the top floor that walked out onto the rooftop terrace. It was clean and safe for the children to wander around. The breakfast was huge! Pancakes, yogurt, fruit, bread, cheese, jams, nutella, fresh orange juice (yum! ), omelets (on request), and mint tea. We ate it on the rooftop terrace each morning. They even prepared breakfast on our early mornings when we were going on a day trip (6:45am) and when we had to catch our flight home (5am!) The airport transfer on arrival was very welcomed, as was the conversation with Renaud upon arrival where he gave us a map and valuable information about where to go, suggestions to eat, and practical tips like always walk on the right side of the street! 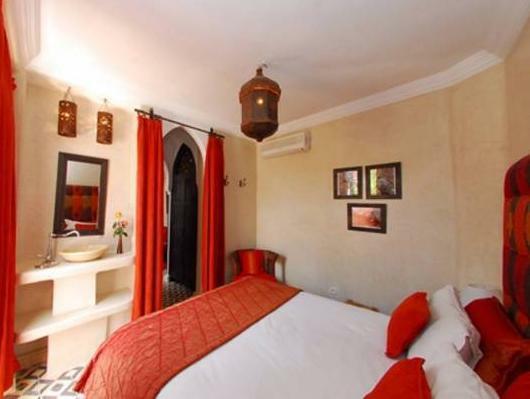 We would have loved to give this Riad 5 stars on all categories, but the location was a little out of the way, however the walk to the souks was safe, well lit at night, and part of the adventure! It’s important to provide a phone number for this Riyadh and directions / distance from main square as it’s not walking distance with luggage and not easy to find if no number provided on your booking confirmation. We had such a lovely time at this riad. 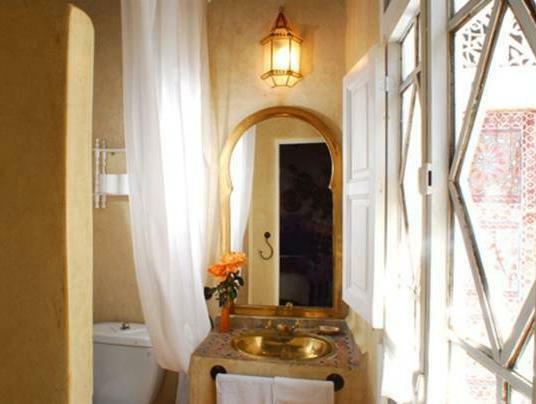 Located in a quiet street in the medina, the decor of the riad was beautiful. We enjoyed a delicious breakfast on the roof terrace each morning and even had dinner there one night. The staff were friendly and eager to help. 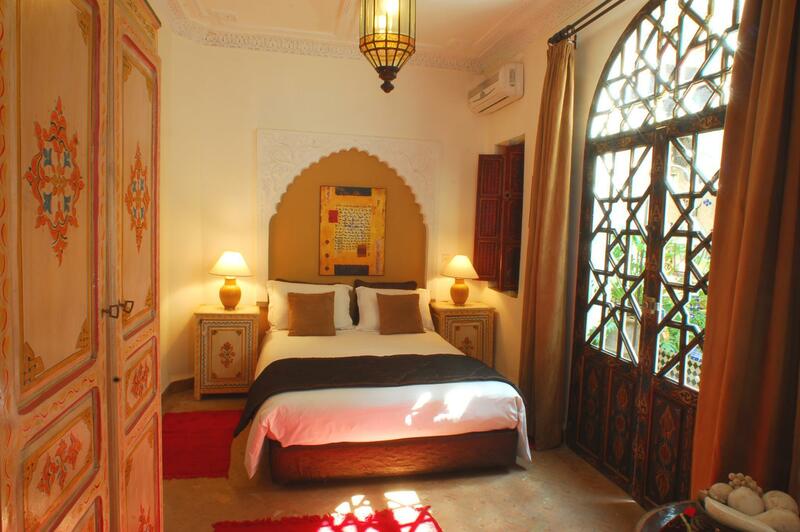 Would definitely stay at this riad again. 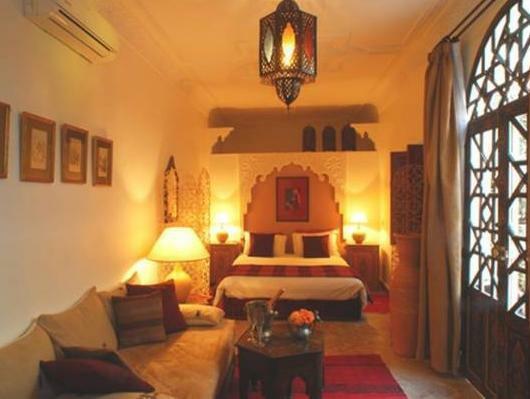 I would highly recommend staying at this Riad.